Dolls, in the left corner we have Joie’s très chic Celia Poncho Sweater; in the right corner we have ModCloth’s luscious Long Flight Sweater. Though ModCloth’s magnificent creation is quite a bit thinner, and constructed out of a mix of polyester and cotton, as opposed to the cashmere of the Joie treasure; for just $42.00, in comparison to the $274.00 price tag of its couture cousin, it is every bit as capable of helping one to create that effortlessly chic style we all strive for – at a price that is oh-so alluring for the frugalista! Thanks to Shopbop and ModCloth for the pictures. kind of digging the Mod cloth one. Isn't it great that the CA weather is letting us wear fall fashion so early! YES! I am all over anything from Modcloth! I am seriously loving this and I love the Modcloth one like none other. I think sweater capes are on the list for all French Women Wannabes (aka me). I don't think I'd mind having it thinner. Especially, if you work inside. It would be great to have at the office. I'd go for ModCloth. Thrifty for me. I like the light weight. Such a cool color. A very sweet poncho. ModCloth would be my choice. Modcloth is one of my favorites! Love it! Hmm, I might actually put on the spendiecap for this one. For cashmere, I would do a lot of things. I am love with anything Modcloth! Love it ^__^ modcloth <3 I need to get one of that in my wardrobe! I think the cheaper one would be great to have. i'd go for the modcloth one! great find! I really like the ModCloth version. Hope you have a good day. I'm not a huge poncho fan, but the Joie one is stunning! i like when people wear poncho sweaters well, so either will do. i would be thrifty!!! at this pt in my life, i only splurge on several things and a sweater isnt one of them! Both of those are gorgeous! I do love cashmere, but Modcloth is wonderful as well! Great find! I don't mind the cheaper material... cashmere is great but soo expensive!! For this I have to say ModCloth wins. It just looks softer. Anything comes from ModCloth is always a big fat "yes"
g l a m o u r !!! das modell. I think it's a great idea to get the Modcloth version and then if you wear the hell out of it take the plunge and invest in the Joie top. I love everything Joie does too. Like this jumper, it is perfect for fall. Ahh, my friend has THE biggest obsession with ModCloth. Maybe I should show her this shirt? you're right but that Joie one looks so cozy and beautiful! Oh, I LOVE that Joie one so much... It looks so soft! It's raining here and I am wanting that (the cheaper version) with every inch of my body. God I love Modclothing... I wish I could own everything in their store! I think I would go the Joie way, both cute but again, I think Fall clothes are investments and that's a good price for a quality item for years to come! I wait for you on my blog! Have a nice day! I am always looking for sweaters in the perfect shade of greige. Thanks for sharing! I love the ModCloth one. I hope you had a wonderful weekend. Take care. These are both such glamorous pieces! But I don't think I can turn my back to cashmere... I'd love to be wearing it right now!! 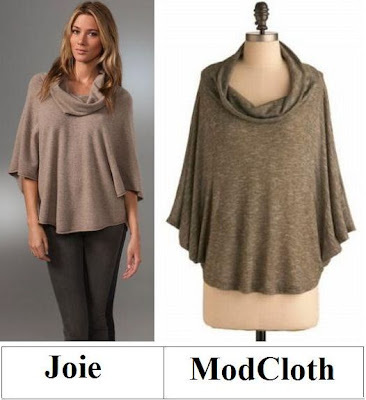 I happen to like the ModCloth version much better, though I'm sure the Joie poncho feels luxurious! Although I'm sure the cashmere of the Joie version is amazing, I think I like the ModCloth one better! Aah, LOVE this! It's like you read my mind:) Hope you enjoyed the weekend! I don't think I would rock either (my tiny frame coupled with my short stature would be swallowed up) but I bet that cashmere feels amazing. If I were to buy something like this, I feel as thought I would wear it more for outerwear anyway versus all day inside. Really affordable! Can't tell the difference between the two and I must admit in some of the comparisons you post, I can. Modcloth is my best choice. It looks comfortable and fresh to wear. I like also its color. Thanks and keep it up! Ohhh tough one. I always adore cashmere and this joie creation is divine, but I am also swooning over the ModCloth version! !